We are officially under a week away from opening night of Beauty and the Beast at Newmarket Theatre! Just in time for tech week, we wanted to introduce two of the shining stars of our cast. Hunter Agnew will be seen as Lumiere after previously performing in Wavestage productions such as Titanic and Big Fish (Don Price). Michael Barker makes a grand return to Wavestage as Cogsworth. Long-term Wavestage audiences will remember him from our productions of Cabaret (Emcee) and Oliver (Fagin). 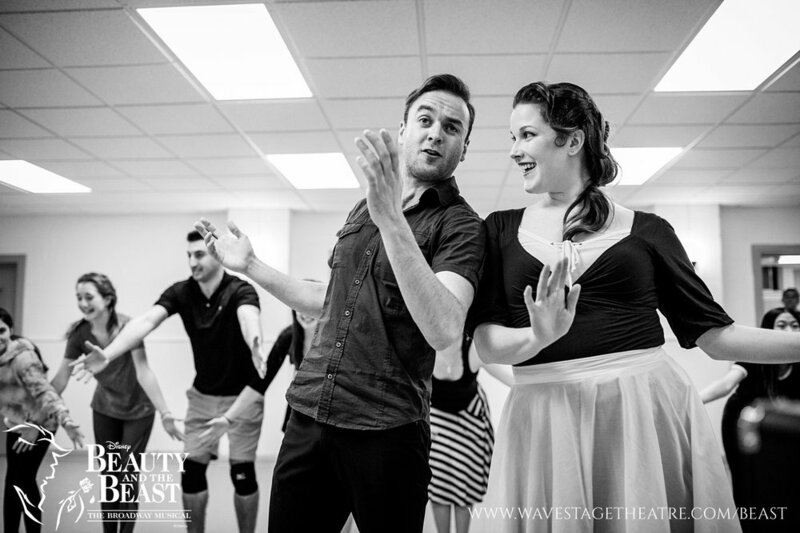 Get to know these two hysterical talents before seeing them on stage from April 19-22 at Newmarket Theatre! Hunter: I became captivated by musical theatre in the ninth grade. My high school had a terrific music program which afforded me the opportunity to travel to Toronto on a band trip and see Jersey Boys and The Sound of Music. These were the first professional musicals I saw and they sparked the flame. Then, in grade ten while rehearsing for Beauty and The Beast (I played clarinet/bass clarinet in the pit band), we traveled to the most magical place on earth, (no, not Disney) New York City. There's something about that place, and if you've been there you know what I mean, it grabbed hold of me and didn't let go. From there it took a while until I actually played a role in a musical, 5 years to be exact - where I made my musical debut as Stevens in the QMT Canadian Premier of Pasek and Paul's Dogfight. Michael: My early theatre experience was limited to Monty Python recitations at dinner and skit night at summer camp. But then, a precursor to Wavestage started practicing next door when I was in university. I joined the chorus for Gilbert and Sullivan's Trial By Jury. I was, of course, soon hooked. Would you say you have any similarities to your character? Michael: Awfully sorry to say this, but yes. I mean no! I mean, wait a minute! The truth is, yes, more than I would like to admit. But being in theatre gives me the chance to extend it into the absurd, and be comical about it. Really, if Cogsworth could laugh at himself (not just laugh at his own jokes), he'd be better off. Just not in front of the staff. Except Lumiere maybe - he's my bud. Hunter: Ha! I would say that Lumiere would be the larger-than-life caricature of myself if I were to have lived in the Disney fantasy of 1900'something. We both love to entertain, make people feel welcome, pull out all the stops, use our eyebrows and talk with our hands. 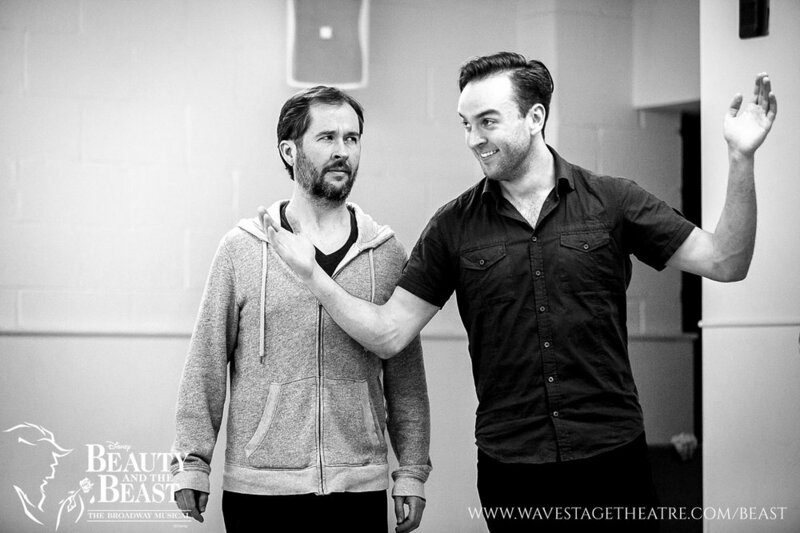 What has the rehearsal process been like for Lumiere and Cogsworth in Beauty and the Beast? Hunter: The process for Michael and I to find the witty, catty, heart-filled banter of Lumiere and Cogsworth has been fulfilling. Michael did an amazing job stepping into the role. We hit the ground running and have had a blast and a half finding the relationship between these two iconic characters. The best part for me so far has been getting comfortable enough to laugh at ourselves and really have fun. Michael: I've been telling friends from day one that Hunter is the most on-point person I've ever worked with in terms of the craft of rehearsing. On top of that, the whole cast exudes positive energy. The best part is when you work with people like that, you can be in a flow every rehearsal, totally absorbed and making great strides. As a clock, my strides must of necessity be shorter and more regular. Ha! What’s the highlight of the show for you? Michael: I love how the Beast scares everyone! And then Belle faces down the Beast, and without losing her cool tells him that it's rude and that he's being ridiculous. It's so wonderful it makes me laugh. That's the point where I say Belle's my kind of hero. Hunter: Gah! There are so many stunning moments in this show it's hard to pick one favorite! Highlights in musical theatre for me are the little things, the magic made in the small moments - here are a few to keep your eye out for when you see the show; Genna's deadpan looks to the audience during "Me", Bevan's perfect Disney villain smile, Milton's bang-on portrayal of LeFou, Amanda's scene-stealing showgirl strut in "Be Our Guest", Natacha's syllables as Madame De La Grande Bouche - and so so many more! What’s the most challenging part about this role? Hunter: The thing that I find most challenging about Lumiere is maintaining crisp, crystal-clear diction while performing in an over the top, characterized French accent. It's a challenge that I was excited to tackle and I hope my deligent dialect work pays off! Michael: It's very challenging overall, but the part of it that's really going to stretch me is physically acting with a box around me. Backstage, everyone's going to have to make way for me, ok? Mob of townspeople, are you reading this? Do you have any pre-rehearsal rituals? Michael: If we have a chance, I always get my family to help me rehearse lines earlier in the day. They tell me it's a treat. They have not said it's "derpy" but I think that's what they're thinking. They're all fans of Beauty and the Beast. Hunter: I strive to be over-prepared. I always review my lines, blocking, choreography, lyrics - pretty much the whole show top to bottom before every rehearsal. I also make sure that I have a fully packed rehearsal bag ready to go with lots of snacks, extra dance clothes, tea/coffee (depending on the day), a large water bottle and of course - a pencil! What brings this story to life in the stage production of Beauty and the Beast? Hunter: No matter what the story, there is absolutely no substitute for the magic of live theatre. Whether it be a tale as old as time or an entirely new production, there is something about sitting in the dark with nothing to do but to watch an incredible story come to life before your eyes that you simply cannot get anywhere else. This production of Beauty and The Beast brings together your favorite songs and characters from the classic Disney movie, together with new and exciting moments that you can only get from THIS production. The opportunity to experience this incredibly talented cast take you on a truly magical journey is one you simply cannot afford to miss. Michael: The movie is awesome, but some of my best lines are not in the movie!! You get to choose which face to focus on - it's a more active experience. Main reason the stage production excels, though: whether you want to look at it scientifically (pheromones?) or spiritually (waves? ), being in the room with the characters puts the experience on another level. What should audiences expect from your portrayals of Lumiere and Cogsworth? Michael: The Lumer will seduce you and make you swoon. The Cogs will astonish you. Together, we'll make you laugh. Hunter: FUN! I hope that Michael and I are able to transcend the hysterical pleasure of these characters to every single audience member. Audiences should expect to giggle, laugh and leave with a reestablished sence that even in the darkest times, humor will always make you feel a little more "human".